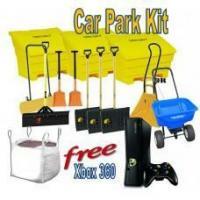 Special Offer: Buy our Car Park Winter Kit and receive a FREE XBOX 360. The car park kit has everything you need to ensure private and public car parks stay safe and usable in wintery weather. The brown rock salt is roughly 94% pure and is widely used in areas with a large amount of pedestrian or vehicle traffic. 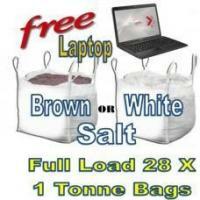 It has a distinctive reddish-brown colour owing to the presence of Marl, an insoluble mineral. The Poly shovel is manufactured from polymer and features an 18” blade for clearing snow. It has a 36” wooden handle with a polymer D grip for easy handling. 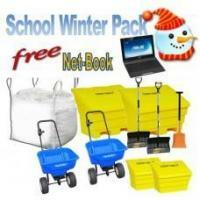 The Polar Tuff snow plow is ideal for removing large quantities of fluffy snow from car parks and paths. It features a reversible blade, a 38” durable composite blade and a vinyl coated steel handle with cushion grip. The Polar Tuff scraper is excellent for fast clearing of light snow and will clear large areas quickly due to its 36" blade.